Damn Fine Print offers our own risograph printing service, meaning we can take your digital files and turn them into gorgeous risograph prints, posters, leaflets, zines and more! If you're new to risograph, read our printing guidelines below to get yourself familiar with the process. Once you've done that, Feel free to fill out our contact form below to get a quote, or take a look at one of our print bundles! 1. Greyscale file for layer 1 (Your_Name_Red.pdf). 2. Greyscale file for layer 2 (Your_Name_Green.pdf). Risograph printing is done by printing individual layers of different colours on top of each other, in a process similar to screen printing. As a result, your artwork should be set up as high resolution (300dpi) separate greyscale PDF files, one for each colour layer. Please label your files with your name and the corresponding colour of that layer when sending them to us. Risograph Colour variation is created by altering the shade of grey in your file. We advise that you do not set text in Photoshop, and instead use Illustrator or InDesign. Do not set text below 6pt, and outline your text where possible. The risograph will create a halftone for you, so there is no need to do any bitmapping on your files. Risograph printers can print up to A3 in size, but cannot print borderless A3. The maximum print area of a risograph printer is 410mmX287mm, bear this in mind when creating your designs. We currently have seven colours available, including our newest addition, Aqua. Risograph colours are not created on any colour-coding system but we use Pantone reference numbers for close approximations. A lot of depth and variation can be achieved through a limited amount of colours, by varying colour densities or overlapping. 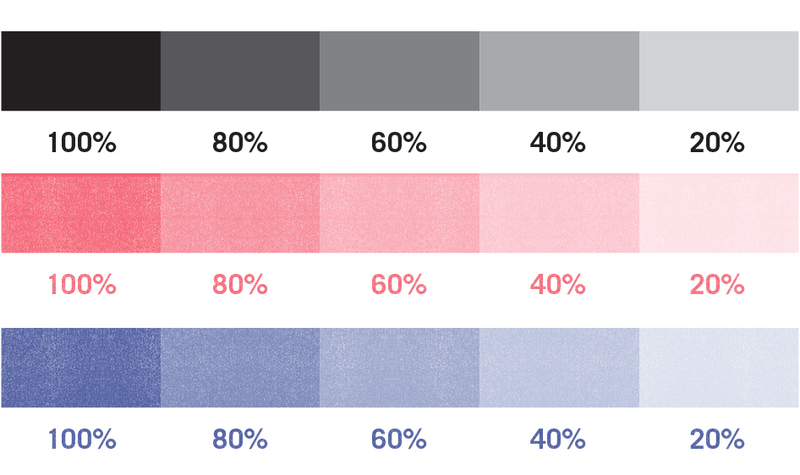 Large areas of block colour should be no darker than 75%. Ordinary full colour printing uses a CMYK process which involves four inks: Cyan, magenta, yellow and black. Risograph inks aren’t available in magenta or cyan. To print CMYK (full colour images) we substitute aqua ink for cyan, and fluorescent pink ink for magenta. We charge a small fee for preparing files in this way. 1. Two overlapping colours, with no trapping, where misregistration has caused a white gap between colours. 2. Two overlapping colours with added trapping to prevent any gaps from forming. The risograph can not print full bleed. We can print on paper up to A3 in size, with a 5mm border on each edge. Bleed is ink that prints beyond the trim edge of the page to ensure there are no white borders after trimming. We trim 3mm off of each edge to remove the white border from images. As a result, the largest we can print a borderless image is 282mm x 404mm. If you are printing a smaller borderless image, you will need to add crop marks and bleed yourself. Each time a new colour is added to a risograph print, it has to be passed through the machine again, which can cause slight imperfections to occur. Multiple passes can cause marks on the print due to the rubber rollers on the machine feeding the print through again and again. Multiple passes also increase the risk of slight smudging and ink transference onto the back of prints. A cool, neutral, high quality stock with a smooth or rough finish. Available in smooth: 100gsm, 120gsm, 170gsm, 300gsm or Rough: 170gsm. A crisp white stock available with a smooth or rough finish, similar to Munken Lynx but slightly warmer. Available in smooth: 240gsm and Rough: 170gsm. A very popular recycled stock with a subtle fleck and a smooth finish. A soft ivory shade which adds a touch a of warmth, with a smooth finish. Available in: 100gsm, 120gsm, 170gsm, 240gsm. A distressed recycled stock, with tactile, textural fibres running throughout. A very pale grey stock with a smooth finish. An ideal and sturdy substitute to newsprint, with the same newspaper-like feel. Ensure that each layer of your file is separate and in greyscale. Do not use any effects in InDesign, as they can effect the appearance of ink densities. If these must be used, reopen your files in Photoshop, flatten and overwrite them before sending. Our risograph bundles offer quick and easy pricing for your project. For those who have completed our intro course or are experienced in risograph printing, we are happy to offer assisted access to the Riso, where a technician will be present while you print your own work. Need something else? get A Quote! Let us know your preference of our stocks listed above. Any questions or queries or details you may have to add. After submitting your form we will be sure to contact you as soon as possible to retrieve your artwork and proceed. If you would like to take a closer look at the risograph printing process, download our guides here.